This site is focused on Motorcycle Safety. It has no brand bias of any kind. Indeed, by 'motorcycle' we mean any motorized two or three wheeled vehicle. It is our intention to provide information that will significantly reduce your odds of having an accident while riding your motorcycle. If you do nothing else while you are here, please take the time to read the Safety Tips. This is not just another "How to Ride a Motorcycle" book. 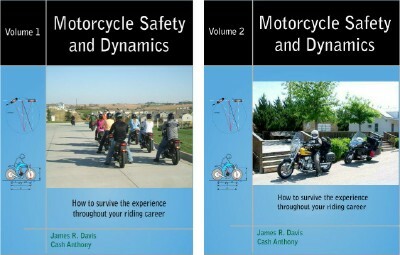 It is a definitive book on how to survive the early stages of the motorcycling experience. It provides insights that will be valuable throughout your riding career. It covers virtually every aspect of your early riding career from your days as a wannabe through being a newbie at the sport, with lessons on the specific skills required to be a truly competent rider, and it explains why. Jim and Cash have distilled the results of over a half million miles of combined experience and have added Jim's detailed analysis of the physics of motorcycling. You'll ride smarter after reading and studying this. 178 pages. For motorcyclists who have already learned how to operate their bikes with competence. Volume 2 provides detailed explanations of such subjects as weight management and traction during braking and acceleration, slip angles, accident avoidance maneuvers, and much more. Group riding is covered, including authoritative suggestions for pre-ride briefings, lane changes and other normal riding maneuvers, and unusual formations involving trikes and sidecar rigs, as well as how to deal with an impaired rider. Riders who wish to carry a passenger, tow a trailer, go camping, or tour on their motorcycles will find information here on how to plan such trips. Jim's spreadsheets and models give readers the ability to analyze complicated issues of physics and motorcycle handling. You'll discover more interesting material than you can imagine when you study the contents of Volume 2. 176 pages. Click on the cover picture to order. The fundamental message found throughout this site. Since the vast majority of motorcycle accidents involve some level of 'rider error', it makes a great deal of sense to strive for making no rider errors. The way to achieve making motorcycling as safe as possible is to make sure that you are never the cause of an accident (yours or for anybody else), that you avoid those situations that are demonstrably less safe than is reasonable, and that you have developed the skills and judgment to deal with any other dangerous situations that may occur. Here is one of the 277 Safety Tips, selected at random. You can obtain the entire 33 megabyte collection of articles in a PDF Portfolio download here. Here is one of the 8 Safety Videos, selected at random. Weight Management Your weight changes with speed! Honest! And it's important. The safety tip articles are my contribution of ideas on the subject. In the Forums part of this board there over 100,000 other ideas presented by thousands of our members for your benefit. The messages are organized into these useful categories. Here are eight real-world 'incidents' that demonstrate the importance of understanding the fundamentals included in the Safety Tip articles. Riding on a freeway when everything, including the weather, is perfect. Then an incident occurs two lanes away. Normal braking skills would have saved this man's life. We drive a green car ... and we kill a motorcyclist. We didn't see him despite the fact that we have unobstructed vision for 1000 feet both ahead and behind us. Yep, we turned left in front of him. Motorcyclist drives over a drainage grate and is ejected from bike suffering broken bones and road rash as a result. Lack of roadway maintenance? A lady motorcyclist is paralyzed. Her fault, but not unless your attorney understands the significance of rider errors. We will demonstrate just how painful that can be to the left turner. A woman rider in Texas, second in a group of three, mid-afternoon, perfect weather, excellent road conditions: in a curve she steers her motorcycle across a double line and into an oncoming pickup truck. Husband and wife mount their Goldwings in their driveway. Husband leaves first. Wife suddenly experiences the motorcycle accelerate (on its own). It launches her across the street and into the curb. Bike is totalled. Motorcyclist, afraid that he is going to collide with 18-wheeler, slams on both brakes and promptly ends up on the ground seriously injured. The trucking company is sued.